Perhaps it’s more useful to view 21 Jump Street as the bawdy sequel to Project X than a remake of a late-‘80s TV cop drama series, and not just because scribe Michael Bacall co-wrote both screenplays. With drug use and its unfortunate consequences running rampant at a local high school, two baby-faced cops go undercover posing as students to infiltrate the pushers and root out the supplier. Instead of life lessons, however, this raucous comedy peddles a far more profane product. Equally irreverent and uneven, the latest big screen revival of a bygone television series follows the satirical playbook of The Brady Bunch, Starsky and Hutch, Get Smart, Fat Albert, The Dukes of Hazzard and so forth. Any viewer hoping for a sensible storyline—beware! 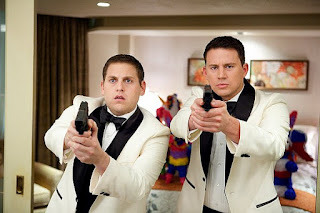 Populating a movie comedy kingdom presently ruled by the unholy trinity of Judd Apatow, Todd Phillips and Adam Sandler, balls-out absurdity and, yes, a bit of wit are the jumping-off points for this “21 Jump Street.” All in all, it lands on its feet. In high school, Greg Jenko (Channing Tatum) and Morton Schmidt (Jonah Hill) were classmates but little more. Jenko was the long-haired, devil-may-care slacker; Schmidt was a nerdy outcast whose dumpy Eminem ornamentation did nothing to snag him a date to the prom. Seven years post-grad, however, the two befriend each other in order to make it through police academy. Once they’re deep undercover, Jenko and Schmidt discover that the concept of cool has shifted since they turned their tassels. Bullying and not caring are out; multiculti tolerance and environmentalism are in. Hybrid parking spaces now sit alongside those reserved for the handicapped, and using either without authorization will get your car booted. And, the popular kids now look like extras from Glee and, in the case of their leader, Eric (Dave Franco, brother of James and terrific), can run a drug ring and edit the yearbook from the same hangout. Hill—who co-wrote the screenplay—is in his post-Superbad element. But the real surprise is Tatum, who jumps headlong into the material with newfound comedic timing. Still, the script threatens to cross the line between inane and icky with its pseudo-love interests: one a teacher (Ellie Kemper) barely stifling her infatuation with the hunky Jenko, the other Schmidt’s flirtations with his 18-year-old co-lead (Brie Larson) in the school’s production of Peter Pan. And, even as the film gives lip-service to gay tolerance, it foists an array of homophobic gags. Beyond the shaggy screenplay and slapdash editing by erstwhile animation directors Phil Lord and Chris Miller (Cloudy with a Chance of Meatballs), this isn’t your Reagan-era 21 Jump Street. Here the cops throw a house party serving liquor and marijuana to minors in order to catch the culprits selling the really bad stuff. It’s more deconstruction than devotion, and if you don’t believe me, wait and see how it handles a particular high-profile cameo.